The construction industry is well populated by software that meets only a portion of the user’s workflow needs. This couldn’t be more true than in the woodworking industry. RSA Solutions prides itself on the strong relationships it has established within the woodworking industry. RSA Solutions extended that commitment by seeking out automation solutions specific for the woodworking trade. 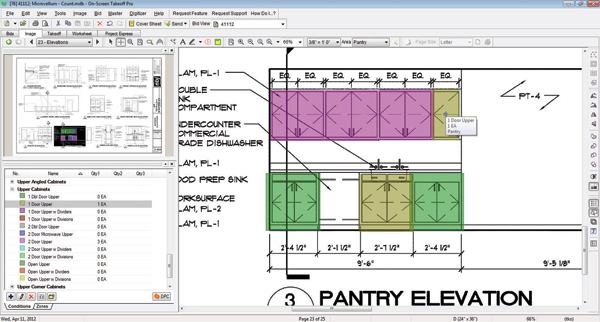 These solutions address the unique aspects of woodworking software including cabinet, cabinetry, kitchen, cutlisting, design, CNC, carving, engraving,nesting, g-code, field verification, and fi eld dimensions. Additionally, RSA Solutions carried that commitment over into the automation of business management, takeoff, and estimating. “We recognized early that RSA Solutions needed to provide solutions that helped our customers win projects and that meant finding the best quantity takeoff solution for woodworking available,” says Maberry. Woodworking software must focus on a contractor’s specific business needs and not the latest technological buzz. The workflow of automation must square nicely with the workflow of woodworking professionals. Takeoff automation must be intuitive to the user’s day-to-day processes. While most solutions only meet about 70-80% of the trades’ workflow needs, On-Screen Takeoff allows companies to leverage the last 20-30% of their investment because it is a solution that thinks like a contractor. The ability to accurately and rapidly perform takeoffs for custom work saves time, improves accuracy, and reduces the risks of exceeding budget. The woodworking estimator becomes more efficient and effective when the integration is taken to the next level by incorporating digital takeoff and addendum updates into the estimating process. The ability to recognize last minute change requests and prepare additions and deletions on the plans for inclusion into the estimating process ensures a bid proposal that will be profitable for the woodworking company and generate satisfied customers. accurate and up-to-date estimate every time. trade specific needs throughout the process. As a technology provider, On Center Software has a responsibility to the contractor to ensure technology is not simply another business tool, but rather a differentiator in the new world of construction. In many ways, this responsibility goes well beyond simply providing a core set of products and top-notch service and support. It also encompasses the way in which such products interact with other disciplines within a company. “We take pride in our ability to partner with a leading woodworking automation provider, RSA Solutions. Working together we deliver seamless integration,” indicates Castelli. On Center Software and RSA Solutions are committed to quality that encompasses the integration of solutions, customer support, and training into a customer’s full lifecycle experience. The success of our customers is the very business of On Center Software and its partners. On Center Software believes training directly impacts the bottom line of customers and as a result has worked with partners to develop a matrix approach to training. It is essential that when customers invest in solutions there is a way to immediately make each and every employee productive. On Center Software and RSA Solutions provide multiple delivery models for easy learning of the curriculum.